Me. Category? Worst. Mother. Ever. Don’t believe me? Just ask Robbie; he’d be more than happy to fill you in on the horrors of being my child for the past week. Thursday night was perhaps the worst night of my life. Other than the night that I spent in labor – but I knew that would end eventually with a fabulous little boy. I wasn’t sure that Thursday night would ever end. Robbie went down around 7:00. He woke up at 9:00 and screamed until 9:50 when Justin came home and took over. Of course, Robbie went right to sleep for Justin. Until 11:00, when he woke up screaming. Again. And at 1:30. Justin brought him into our room at that point, too tired to keep soothing him from the rocking chair. Robbie stayed there, tossing and turning, until 4:30. And then he was over it. We finally put him in his crib and let him scream. And scream. And scream. Until almost 6:00 when he finally wore himself out. I felt like a terrible, horrible, no good, very bad mother. But I couldn’t deal with it. He was fed, dry, and warm. And I was going to lose my mind. Justin and I weighed the options and decided it was best for everyone to just let him scream. I knew it was an ear infection around the second time Robbie woke up. However, as any seasoned mom knows, there’s nothing you can do about it until the doctor’s office opens the next morning. There are only so many times you can try to shove Tylenol down a baby’s throat. Or offer him a bottle and have it thrown across the room. So, we waited. But we were at the doctor’s office when the door opened for the walk-in clinic at 8:00. I was right. It was an ear infection. Actually, it was two. And a cold. But, lovely child that my son is, he turned on the charm and flirted with the doctor. Me? I burst into tears, so tired of the screaming and not being able to fix anything. Robbie’s doctor told me that I’d done a great job. In fact, she confided that that morning, she’d told her two little boys they needed to get their acts together because, although she loved them, she did not currently like them. This made me feel a little better. We spent yesterday in New York visiting Justin’s family. It was the first time Robbie got to meet them, and he was a perfect gentleman. He even took his medicine without a problem. Twice. And then it was back to Bartlett Avenue, where all hell broke lose this afternoon. Robbie didn’t take a nap. He was wound up and, at some point, pooped (we all know the fun of Augmentin, right?). I got him up and tried to clean the house. Robbie wasn’t having it. He knocked down the gate to the bathroom. He tore down the (already broken) linen closet door. He knocked down the gate by the stairs. It was all I could do to remind myself that I was the adult in the situation. And I had to remind myself over and over and over. After he screamed. After he clawed my face. After he tried to choke me. Eventually, I did the only other thing I knew to do: I took Robbie and left the house. After all, in public, my child is charming and there are witnesses. I have to be the adult in public. We went up and down the aisles. I took my time, sifting through coupons (I saved over $71 with my card and the coupons). Robbie flirted with people in the aisles, the cashier, the bagger, and the people in line behind us. Then we got home. He screamed for a cheese stick, so I gave him one. Then he screamed for another. As I was opening it in the disaster area that is my house, Robbie opened his mouth and spit out all of the cheese he’d just chewed. Much to Barkley’s delight. Speaking of Barkley… My other “child” is also on the list. He peed in the house twice today. In the middle of the disaster. But, back to the rest of the day… Robbie tore around the house, pulling items from drawers and throwing them onto the floor. Finding myself at my wits end (again) and without any other errand to run, I put Robbie in his Pack ‘n Play and went to the other side of the house. He ate dinner on his own, too. I just couldn’t bring myself to sit with him while he threw food and screamed. He screamed his way through dinner. And his bath. And getting dressed. And medicine-taking. He tried to throw the bottle again. He squirmed out of my arms when I tried to rock him. So, I ignored him. Went about my business, putting away laundry. He puttered around for a little while and then got his bottle. He climbed into my lap and fell asleep in my arms after a long talk about how I was a bad mom and he was a bad boy but we were both going to work on being nicer tomorrow. The time? 5:55. It’s been a long four hours since then. I cleaned our room, sorted through my clothes, bagged up four bags of things that didn’t fit. I dusted and vacuumed. I finally got the groceries (mostly put away). I did a load of laundry (still have to remake the bed). I cleaned up chicken juice from some chicken Justin defrosted – dated December 2009. I purged the fridge of rotting produce. I cleaned up Barkley’s second mess. Is everything finished? Absolutely not. There are still (non-perishable) groceries on the counter. Only one load of laundry got done. The downstairs wasn’t vacuumed or mopped. But I’m all set. Done. Ready to put clean sheets on my bed and crash. So, I’ll leave you to mull over your less-than-stellar parenting moments. And perhaps not feel so alone in them. This afternoon had all the makings of a fun adventure. Grandmama is here. Daddy is in class. Barkley was in the mood to play. And then Robbie crashed. He threw a fit when I went out back to clean up the yard. Incidentally, melted dog poop is disgusting. Best just to clean it up before the next snow comes. Roberto threw turkey stew and pears across the living room. He dumped Selsun Blue into the tub, making it near impossible to wash his hair and face. And then he made his escape from the bathroom, running around the house like a naked maniac. 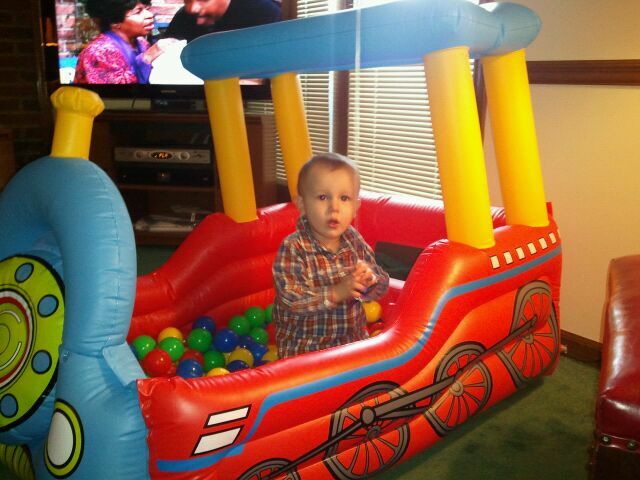 From the bathroom to the living room, where he laughed at Grandmama and turned in a few circles. 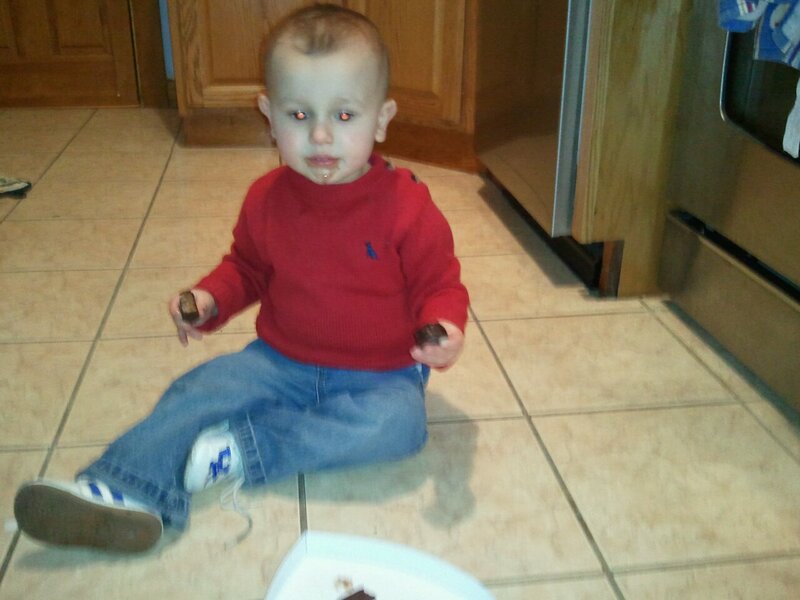 He looped through the kitchen and then dining room and tore back up the hallway toward me. And then he wiped out. Full-frontal disaster. I didn’t notice the blood right away. But it was there. All over his face and hands. In his mouth, covering his teeth Probably made worse by the snot dripping from his nose. I couldn’t even tell where it was coming from. Eventually, I was able to wipe his face enough to figure out that Robbie had bit his lip during his face plant. Perhaps it was my lack of experience with blood, but I figured he was doing OK if he was willing to take a bottle. Which he was. 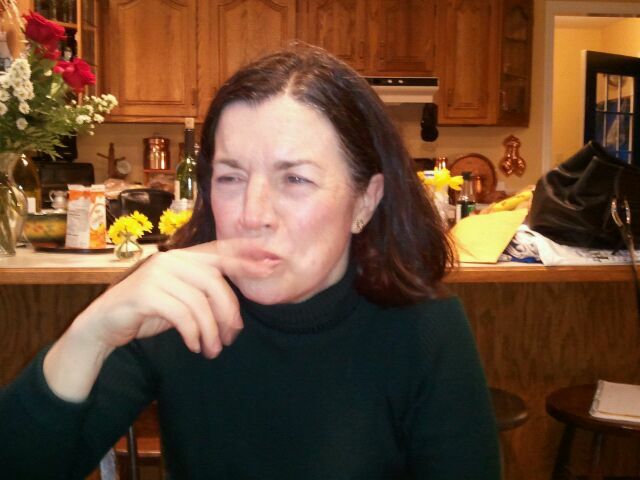 The lip may be swollen tomorrow, but at least there was no panicking tonight. This picture might be the only smile I got from Robbie. 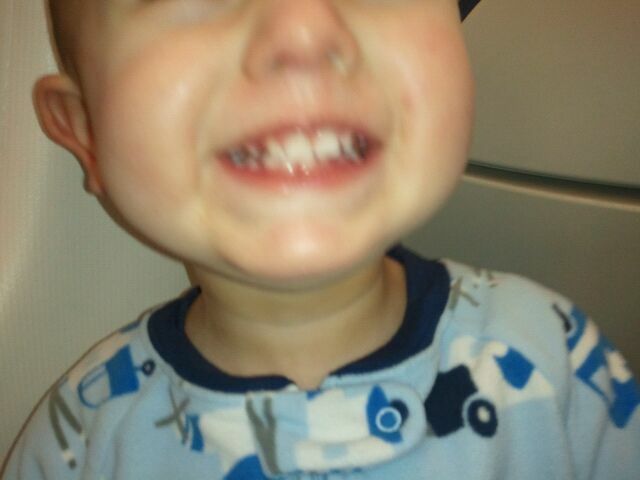 It’s his “Cheese!” smile. 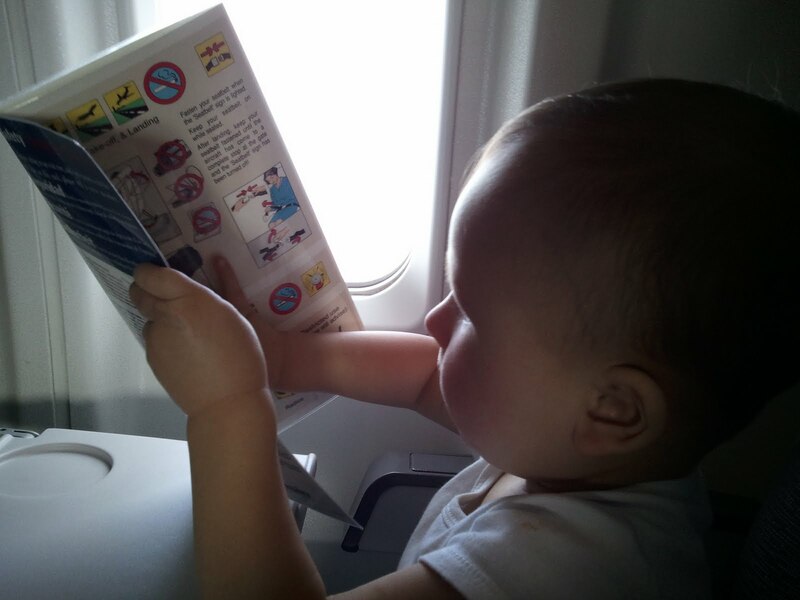 If you know how to get a child to behave on a plane, please let me know. Apparently I have no idea. At all. On our first flight, we cleared the front of the plane. The gentleman sitting on the other side of the row first moved up to the front row to escape us. As soon as the “fasten seat belt” sign went off, he bolted to the back of the plane. I got the last laugh, there, though… The poor guy was also on our flight to Boston. I won’t lie; I got a kick out of seeing the irritation wash across his face when we passed him during boarding. We had seats to ourselves during both flights, which was a huge relief. It’s so much easier to deal with a squirmy child when you don’t have to also worry about him kicking the woman next to you. Or vomiting on the gentleman in the suit on his way to a job interview (as happened in August). Robbie does, apparently, enjoy flying the business commuter flights to the standard puddle jumpers. As soon as he was able, he left my lap to stretch out in the leather seat and sit like a real big boy. He made friends with the flight attendant and was, perhaps, the only one to listen intently to his presentation on how to buckle a seat belt and use an oxygen mask. I disappeared when I went to Kentucky. And it’s not because there isn’t electricity or cable in Kentucky, although that would be a good excuse. It’s partly because I just wanted to enjoy being home and partly because I don’t really like my mom’s computer. I know that sounds silly, but there’s something comforting about the old Mac. Robbie and I did it all while we were home. Lunch at Shakertown with Tom’s family. Dinner extravaganza with the Dreidame clan. Crazy child. Lunch with friends. Pedicure and manicure with the mom. Visits to our 103-year-old friend in the nursing home. A trip to the children’s museum. A note about going to a children’s museum… First thing in the morning on a school day sounds perfect, right? All the big kids are in school. The little kids can run around and play with everything. Right? Uh, no. School days are actually the perfect time for, you guessed it, field trips. There were big kids everywhere. Even in the “under three only” section. We went with my good friend Jill and her two boys and still managed to see everything that was open. And, you know what, the hour that we spent there was just enough. It was the moments where we weren’t doing anything that made the trip so memorable. And, since a picture is worth a thousand words, it seems easiest to just show you what Robbie and I did for five days. Most importantly, Hilary (Heeahee) had a balloon waiting for Robbie. 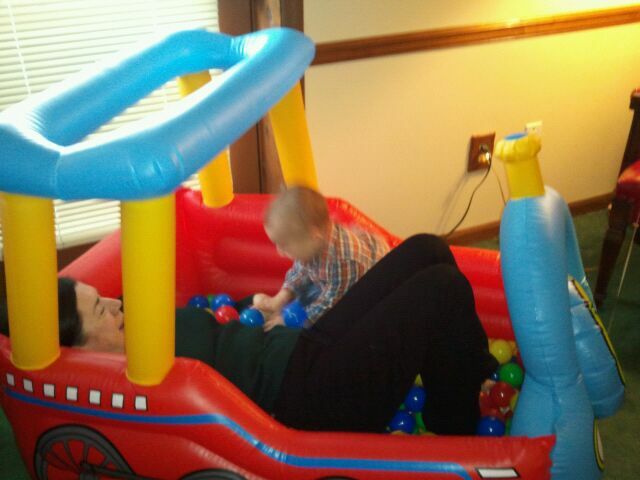 And Nona tested out his ball pit to make sure it still worked. Luckily, it was big enough for two. And Robbie was happy to share. Robbie didn’t have to share the entire time, though. Eventually, Nona got tired of the ball pit and Roberto got to play on his own. 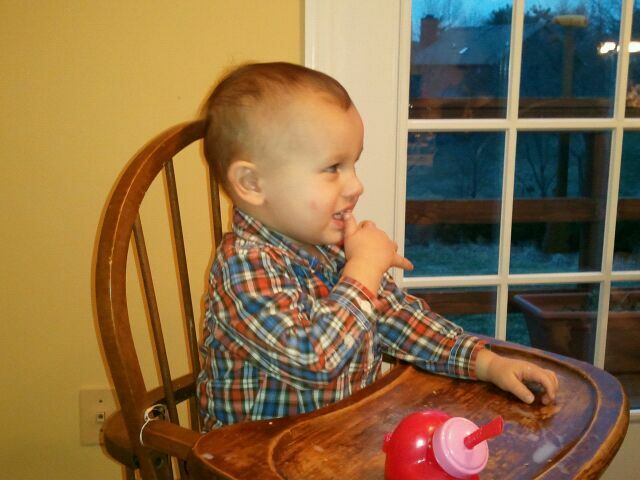 And then there was figuring out how to make funny noises with his mouth… Nona helped him figure out how to do it. Eventually, Robbie was making his own noises. 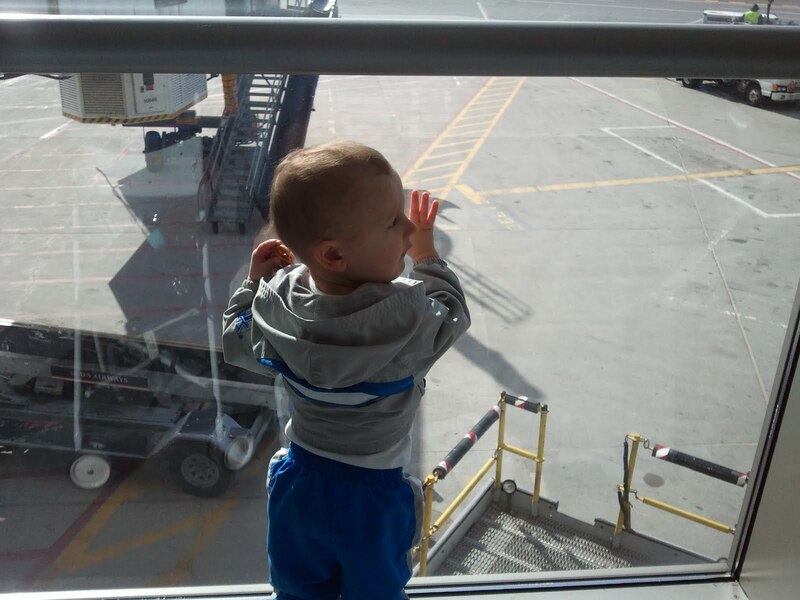 Leaving for Boston was rough. It always is. I hate that last hug from my mom and sister. I hate shutting the door to the house knowing that I’m leaving. Especially when I don’t know when I’ll be back. 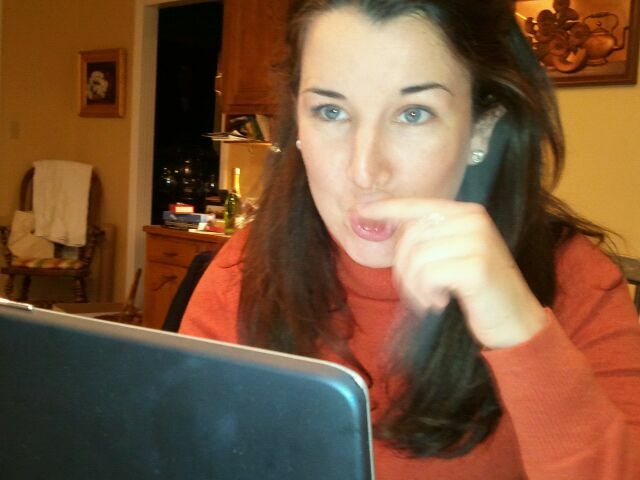 But, I’m recovering and adapting back to life in Boston – snow and all. Yes. I was the lady with one of “those” kids on the plane. Again. Roberto was none too pleased to find himself seated on my lap for a two-hour flight from Boston to Charlotte this morning. And the man in front of us was perhaps even less pleased to find himself seated in front of a cranky nineteen-month-old. Particluarly after my darling child chucked a book at his head. After kicking and hitting his seat for well over an hour. When I offered an apology once we’d landed, his fiancee readily told me it was fine. However, the gentleman directly affected didn’t even turn around to acknowledge me. Part of me understands. Part of me wishes a child on him who does the same. Our second flight started off much the same way, although we were fortunate enough to have a row to ourselves (only because I asked the gate agent to move us). However, Robbie found himself forced to sit in my lap for taxi, take-off, and landing. He immediately started screaming. The flight attendant offered Pringles, which I declined because I knew they would have been thrown around the plane. She came back a few moments later with a stuffed cow. Wearing a cowboy hat and bandana. That mooed three times (loudly) when squeezed. From San Antonio (I know only because that’s what the banner across the hat read). It came from a lady three rows up. The woman in front of us turned around and proceeded to play with Robbie for fifteen minutes. This cow was, without a doubt, the most hilarious thing to happen to Robbie. 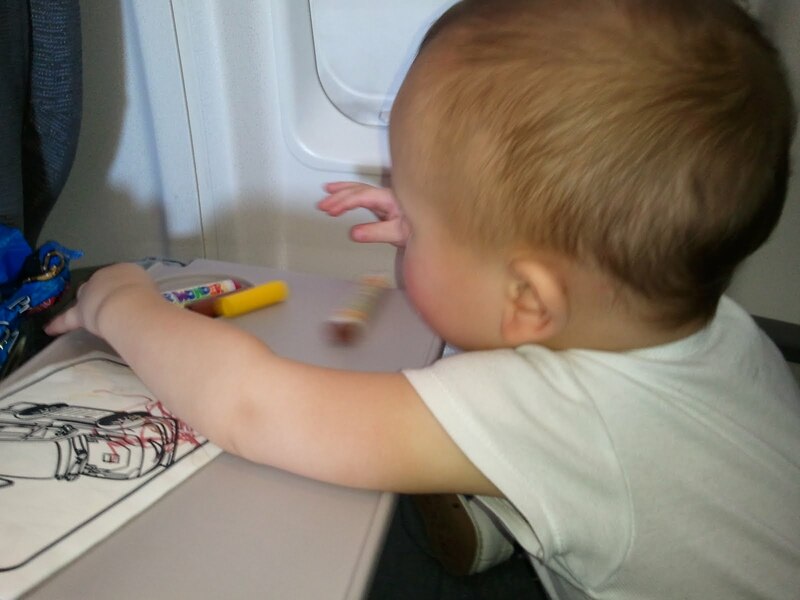 He passed the rest of the time coloring, organizing my pens, throwing peanut butter crackers (donated by a lady from the first flight, desperate to stop my screaming child), and blowing kisses at the other people on the plane. It was, all in all, an extrememly successful flight. Made even more successful by its timely arrival in Lexington. A timely arrival was paramount today. I had a ticket to the Kentucky game, which started at 4:00. My flight landed at 3:43. I was in my seat by 4:10, and Robbie was on his way to Nona’s house to take a bath and decompress from the strenuous day of travel. The game was, in a word, amazing. 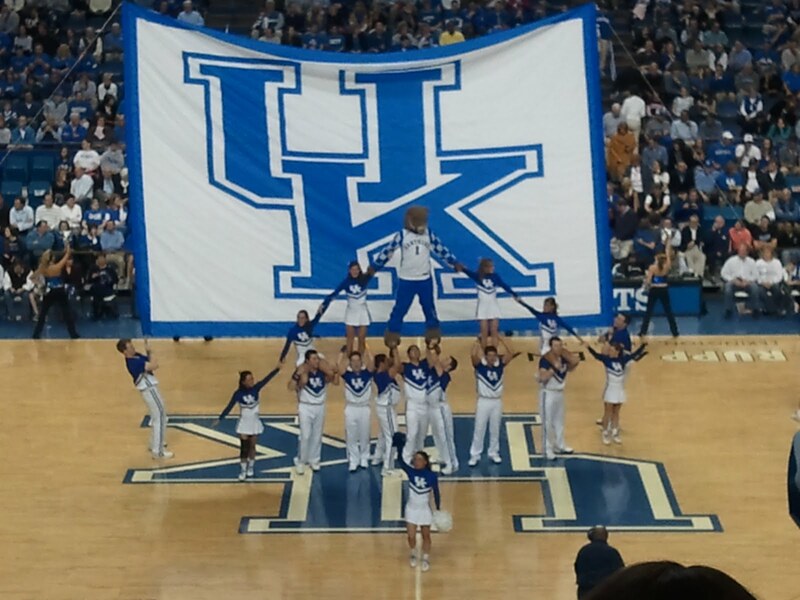 They were up by twenty when I got to Rupp Arena. I saw the most exciting game I’ve seen in years. Sure, it wasn’t intense. But it was a lot more fun than the Coppin State game. Or Hartford. Or whatever no name team we saw in 2008. It’s amazing what temperatures above 32 degrees, a good run, and a bath-time dance party can do to lift your spirits! It was, I’m sure, mostly the dance party. Robbie and I got home late (I did a full 68 minutes at the gym – clocking in five miles! ), so we had a quick dinner and then it was off to the bath, with the Glee Cast station on the cell phone at full blast. Robbie bebopped through his bath, taking time to clean his balloon thoroughly. After all, even a balloon gets dirty after three days of intense play. We practiced blowing bubbles in the tub, Rob laughing hysterically when I came up from the water with bubbles all over my face. He kissed me and leaned up against me and even let me wash his face. It’s amazing what music can do! We jammed through teeth brushing, diapering, and pajama-putting-on. Robbie rocked out while I made my bed and picked up the third floor. He even started singing along a little bit. And then it was time to go to bed. Robbie calmly handed me back my “pone” and cuddled up with Moo. For about thirty seconds. He was unsatisfied with the water I gave him and let me know in no uncertain terms that he wanted “nait nait” (milk). As soon as I brought him some milk, he laid down, wrapped his arm around Moo, said “lou you” and “night”. And that was that. Now, the house is clean. Dinner has been cooked. And I have some time to read and catch up on my DVR’ed shows. Yeah. Mid-winter blahs defeated. At least until the next snow storm! I have them. The mid-winter blahs. No real sun in recent memory. Mounds of snow on the ground. Six snow days to make up. A house I can’t air out. A husband who’s in class or study groups four to six days a week. A child who likes to color his face with my lipstick. Yup. The blahs are here. I keep hoping that I can shake them, but nothing really seems to be working. Not the gym, where I could only run for three minutes before stopping from frustration. My bra strap kept slipping (no sports bra today), and my hair was in my face (yeah, forgot the rubber band, too). And my child wouldn’t stay in the play area. Clean house didn’t happen. I’m giving up on that for the next week or eighteen years or so. For now, I’m going to have to look forward to Saturday morning when I get to fly home to Kentucky. Five blissful days of not being in charge. Of living in someone else’s house. Of not having a dog whine in my ear at 5:30 in the morning and then poop in the dining room anyway. Yeah. I need a vacation. I need to pass Go, collect $200, and move right on to spring. How many days are left again? I hate Valentine’s Day. There. I said it. I think it’s a crappy holiday. It makes you feel terrible if you’re single. It stresses you out if you’re not. It. Is. The. Worst. Holiday. Ever. It’s a day of expectations and disappointments. Even in second grade, when you’re hoping the boy you have a crush on will put a little extra note in with your Snoopy Valentine. But, no. It’s just signed the way he signed everyone else’s. Robbie was helpful at home, running in circles with a ball, a lawnmower, and, yes, his balloon. And he ate dinner with me while we watched The Berenstein Bears. Balloon in hand. Justin made it home around 7:45 for an anti-climactic end to the worst holiday ever invented. Just enough time left to sit on the couch and listen to bad 90s music. Bah humbug. We celebrated Valentine’s Day a little early at the Manna house this year, since Justin has a late study session tomorrow night. Even though Robbie has no idea about Valentine’s Day, I still picked up two small presents for him. I should have only bought one. 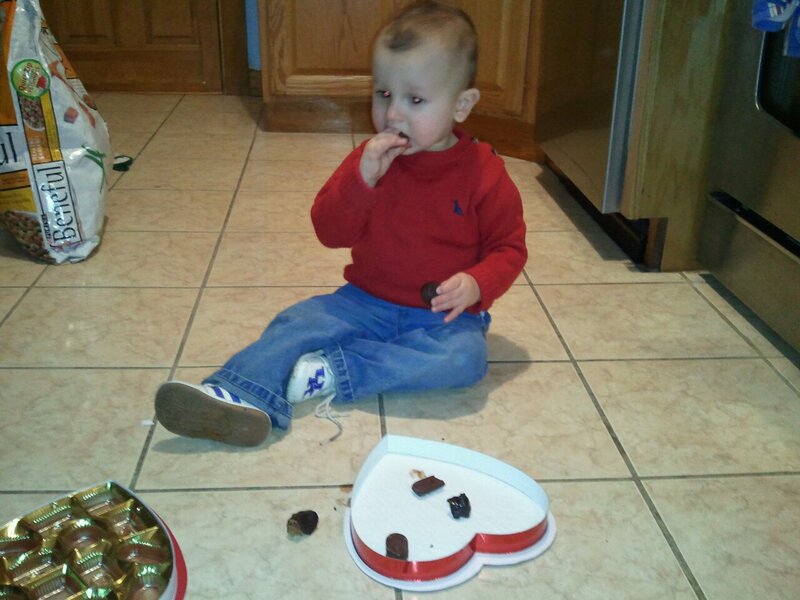 When Robbie came downstairs from his nap, his present was on the coffee table – unwrapped, of course. I might have been a day early, but there was no energy to wrapping anything. He went straight for it. There was a box of alphabet books (one for every letter). Attached to the box was a Mylar balloon. Heart shaped. Red with chocolate candy and “I love you” written on it. Robbie grabbed the balloon, unclipped it from the box, and didn’t let it go. 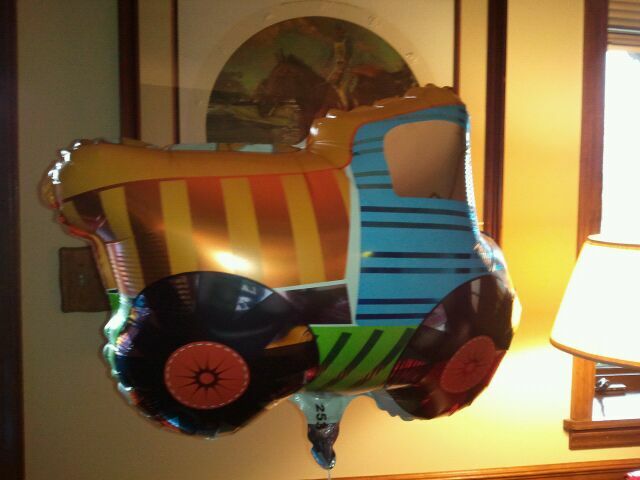 That balloon went all over our house; it even ventured into the basement. Robbie, Justin, and the balloon watched Star Trek. They ate dinner together. They made a mess in the living room together. And then came bath time. 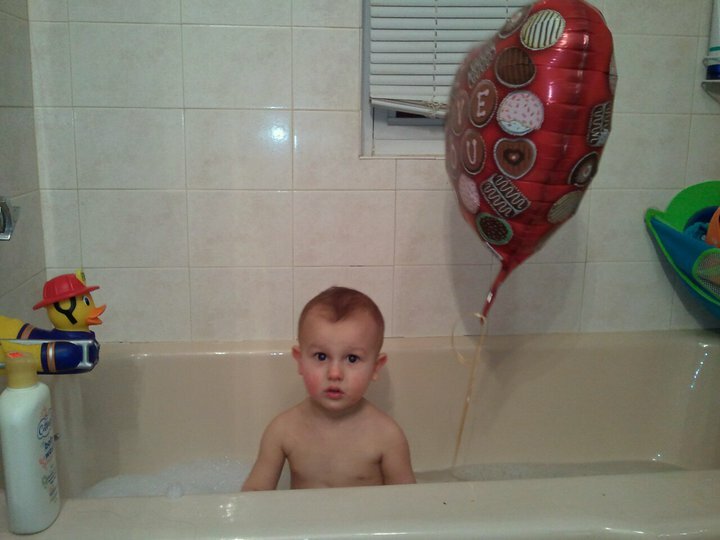 Robbie took the balloon into the bath. He cried when I took his shirt off and the balloon string got caught in the sleeves. He washed his face and hair while holding onto the balloon. When I got him out of the tub, he screamed, “Ba-oon!”, reminding me that he didn’t want to leave it there. He brushed his teeth while holding onto the balloon. We barley separated the two of them to get Robbie dressed for bed. After he was dressed, I set Robbie down. 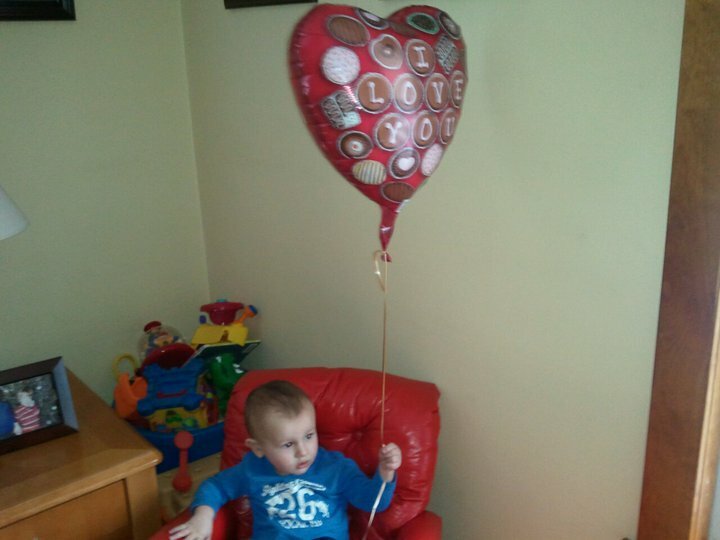 Five seconds later, and he was running all over the upstairs with his balloon. I had to do a quick rescue mission from the stairs when Robbie decided that he and the balloon needed to go downstairs just one more time. When I put Robbie in his crib, he stood up and screamed. I assumed it had to do with the balloon, but it was me this time. He wanted to cuddle with me. And so, good mother that I am, I held Robbie on my lap and rubbed his back. We sat there, rocking, for ten minutes – Robbie, Moo the giraffe, the balloon, and me. He eventually let go of Moo. But never the balloon. 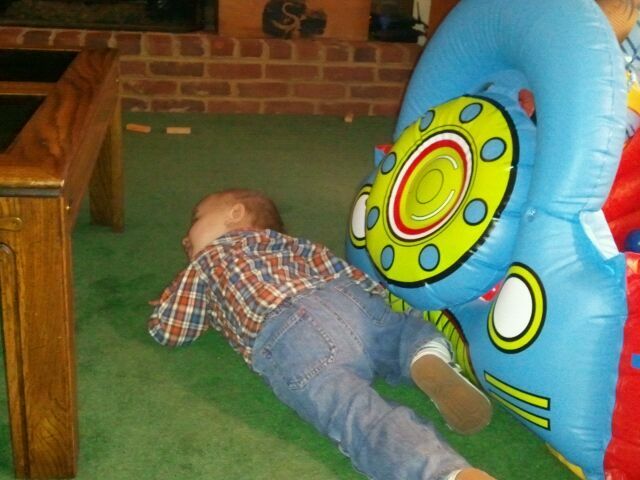 He went to sleep holding onto the balloon. I know, I know. 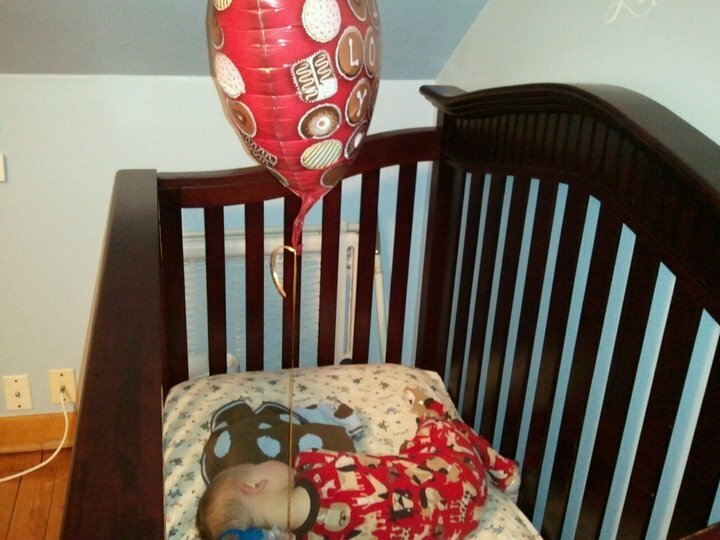 Never let a kid go to sleep holding a balloon. 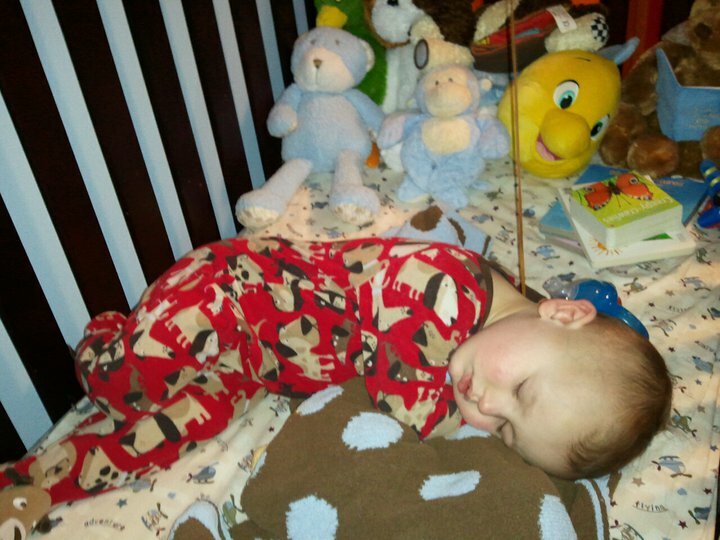 I just went up and took it out of his crib – but not before snapping a few pictures!